Bear's petimonial proves one thing — the simple fact is that some pets just have a knack for turning a little bit of mischief into some pretty serious misfortune. Although you can't avoid it, you can be prepared for what you don't expect. That's where pet insurance comes in handy. Dax is a 2-year-old male Tabby cat, whose love of frolicking around on fences ended up becoming a bit of a sore point. Literally. On the 28th of August 2014, Dax was out for his usual nightly stroll – the unusual thing was that he never returned. The next morning, his parents received a call from a neighbour who’d found him impaled on a copper security spike, one metre high by ten millimeters in diameter. Things were at the pointy end of proceedings: Dax hadn’t just suffered a slight poke, he’d slid all the way down to the bottom of the spike and he was stuck around it. Dax was rushed to CARE (Centre for Animal Referral & Emergency) for treatment, where the vet found a large, dirty wound in his right inguinal/flank region. He was placed under general anaesthetic so the injury could be cleaned, the active bleeding brought under control and the wound sutured and provided with a drain. Dax was placed on pain relief and antibiotics to prevent infection. However, on his recheck the next day, the vet discovered that Dax’s wound was emitting a terrible smell – a clear sign of infection. He underwent another surgery to remove the infected tissue. That increased the size of the wound, so it needed to be closed with a skin flap and covered with dressings. 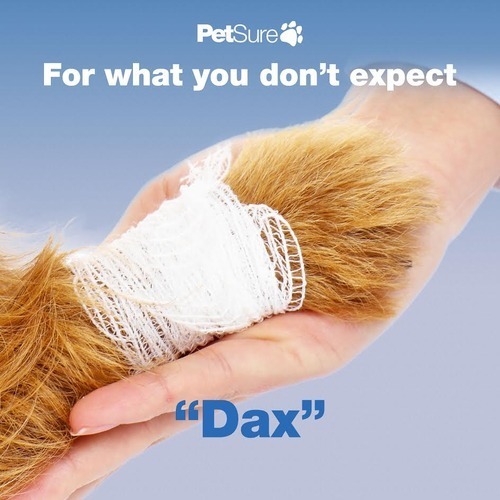 On the fifth of September when Dax returned for bandage change and wound assessment, his owner reported that the wound had begun to smell again, so Dax underwent another procedure to have his drain removed. Special dressings were required to maintain negative pressure on the wound too. Although he had a few good days at home after discharge, Dax began vomiting and his skin was hot to touch; he was lethargic and could only eat small amounts of food. So it was back to the vet, where the vet determined that Dax might be having a reaction to his medication. Broad-spectrum antibiotics and strong pain relief were prescribed, and Dax’s condition began to improve. With the infection disappearing his wound slowly began to heal. By the 18th of September, Dax was happy at home: his disposition improving and his appetite healthy. The injury required ongoing cleaning but Dax didn’t let a puncture wound deflate his mood. It might have put a hole in the family savings though, if he wasn’t protected against the expected: the total cost of Dax’s ordeal came to $10,357.36. Luckily, we were able to help out by covering $8,224.93, with all claims assessed and paid within 3 days. Cooper is a nine-year-old domestic medium-hair cat who was out and about on the 26th of April 2013, when something unexpected came to a head. Literally. After suffering a serious unknown trauma (that vets later attributed to either a car accident or a dog attack), she was rushed to Victoria’s Southern Animal Emergency Centre with life threatening injuries. After a prompt CT scan, Cooper was diagnosed with skin and soft tissue wounds, a skull fracture with severe brain swelling and associated brain bleeding from the damage. She had already developed a range of worrying neurological signs, including abnormal eye movements and circling, so a craniotomy (brain surgery) was performed at Southpaws Specialty Surgery. 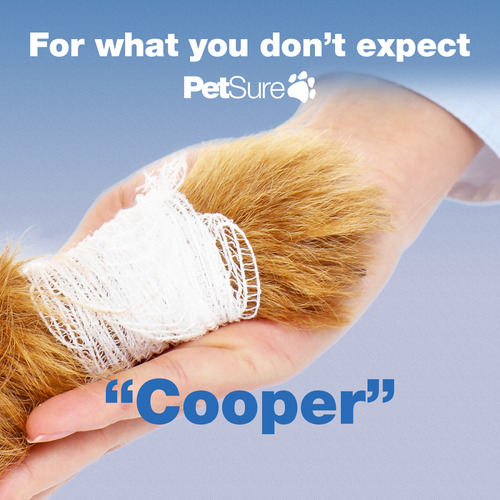 Cooper’s situation looked like it would improve, but it was closely linked to the management of potential infection. Put simply, it became clear that intensive care would play a vital role in her recovery. Cooper required some pretty serious ongoing care, including medications, serial blood tests, neurology examinations and other continuing treatments, and it was looking like the costs would be just as extensive and significant as the recovery plan. So Cooper’s parents requested that a Pre-Authorisation be done at 8:35 on the 29th of April to ensure that the proposed costs would be coverable and to determine whether she could stay under constant monitoring in hospital. A Veterinary Claims Officer reviewed Cooper’s case the very next morning, and approved the treatment costs involved with her condition at 10:18am on the 30th of April. The vets persisted on with the extensive treatments, including the use of multiple antibiotics, anti-nausea medications, oxygen therapy, ongoing pain fluid and blood transfusion. After some tense moments, some ongoing blood loss, and even a bout of pneumonia, Cooper’s condition slowly began to improve. By the fourth of May, the vets listed little Cooper’s prognosis as being fair – much to the relief of her parents. Her neurological issues continued to improve too: she had regained her sight and was responding to sounds, and it was decided that she was stable enough for intensive home nursing. For a while looked like Cooper’s horrible ordeal may end up costing her the ultimate price, but after the surgery and intensive care that helped save her life, the final bill stood at $20,576.65. Thankfully, Cooper was protected with an RSPCA policy, so we helped reduce that figure with contributing benefits of $11,000.00 (after her maximum annual policy Benefit Limit was reached), in a turnaround time of just five business days. Little Cooper proved that she’s quite the trooper, and the tale of her head proved that it’s always worth being covered from head-to-tail.